Mode: High-Middle-Low, Hidden strobe, SOS, Beacon, Moonlight, Locked. ✎ Technical Parameters. new XHP 50.2 with a lifespan of up to 50,000 hours . 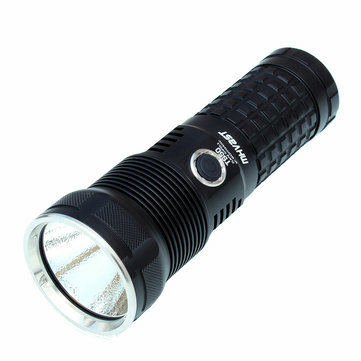 ✎ Maximum output 2920 lumens(ANSI FL-1 standard) . ✎ Working Coltage:8.4V-12.6V DC . ✎ High efficiency constant current circuit and output constant current . ✎ Premium type III hard-anodized anti-abrasive finish . ✎ Bezel : stainless steel. ✎ Humanized side switch function, one button open or close the flashlight ( hidden strobe/ SOS/beacon moede) . ✎ Ergonomic grip with anti-roll design . ✎ Compatible battery:3*18650 Lithium batteries; The battery rack is provided. ✎ Lens:toughened ultra-clear glass with an anti-reflective violet coating . ✎ High performance aluminum orange peel reflector . ✎ Mode Selection High-Middle-Low ,(hidden strobe/ SOS/beacon mode),Moonlight mode,locked mode. and outage will memorize the current mode. 3.Double click the switch quickly to access the hidden strobe mode,double click again to access SOS/beacon mode. 5.In Moonlight mode,double click the switch quickly 3 times to turn to locked mode,then double click the switch quickly 3 times again to unlocking.